With updates to its electronics, the state-of-the-art neutrino detector now boasts impressive “signal to noise” sensitivity. A 3D reconstruction of various particles, including neutrinos, interacting with the argon atoms inside MicroBooNE’s time projection chamber (TPC). This reconstruction is based off of when and where electrons produced by such interactions hit the plane of wires at one end of the TPC. A U.S.-based international collaboration studying “ghost-like” fundamental particles called neutrinos at an experiment known as MicroBooNE has produced the clearest images of neutrino interactions yet. The U.S. Department of Energy’s Brookhaven National Laboratory contributed to the design of this experiment from the beginning, and recently designed novel low-noise “cold electronics” for the detector, which is located at DOE’s Fermi National Accelerator Laboratory (Fermilab). A U.S.-based international collaboration studying “ghost-like” fundamental particles called neutrinos at an experiment known as MicroBooNE has produced the clearest images of neutrino interactions yet. The U.S. Department of Energy’s Brookhaven National Laboratory contributed to the design of this experiment from the beginning, and recently designed novel low-noise “cold electronics” for the detector, which is located at DOE’s Fermi National Accelerator Laboratory (Fermilab). With implementation of sophisticated noise-filtering software and updates to the detector hardware, the MicroBooNE collaboration has produced new clean images that make it easier for researchers to spot and study different types of neutrinos. A paper published in the Journal of Instrumentation illustrates the electronic challenges and solutions that led to this advance. “These innovations will naturally be included in the next generation of neutrino detector design,” said Brookhaven physicist Xin Qian, the leader of Brookhaven’s MicroBooNE physics group. The next generation is a big deal, literally: four 17,000-ton neutrino detectors (compared to MicroBooNE’s “small” 170-ton detector) are planned for a future Deep Underground Neutrino Experiment (DUNE). This massive project will attempt to solve some of the biggest mysteries about neutrinos and their role in our universe. Trillions of neutrinos—abundant yet elusive particles created in the nuclear reactions powering stars—stream from our sun to Earth every second. But because these particles so rarely interact with matter (which is why we don’t feel them passing through us), the detectors built to spot them must be extremely large and sensitive. To study neutrinos, scientists often also turn to more intense and easily understood sources of these particles: nuclear reactors and particle accelerators. The MicroBooNE collaboration studies neutrinos generated by the Booster proton accelerator at Fermilab, and collects detailed images of their interactions with a detector called a liquid-argon time projection chamber (LArTPC). Although a ‘time projection chamber’ may sound like something from a Michael Crichton novel, it’s a very real technology that has transformed neutrino physics. 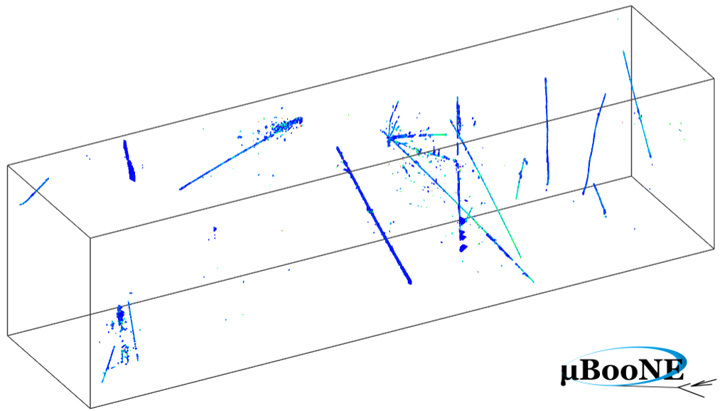 It’s one of the few types of detectors that can see most of what happens when a neutrino interacts inside. Neutrinos come in three different “flavors”—electron, muon, and tau. As these neutrinos sail through the LArTPC’s school bus-sized tank of argon, kept liquid at a biting -303 degrees Fahrenheit, they occasionally interact with one of the argon atoms. This interaction produces charged and neutral particles, with a charged particle sometimes corresponding to the type of neutrino involved. The charged particles shoot through the bath, kicking electrons off the argon atoms they pass. These electrons get caught in the tank’s strong electric field and zip toward one end, eventually striking an array of wires. Based on the time and placement of each signal generated when an electron strikes a wire, scientists can figure out where the neutrino collision took place and what it looked like, allowing them to determine the type and energy of the neutrino detected. 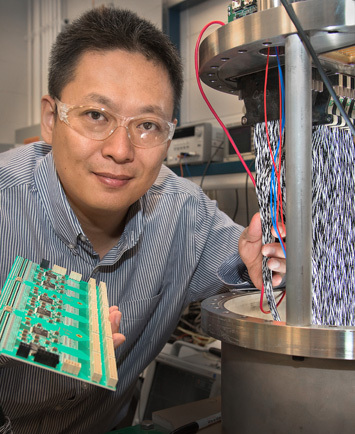 Brookhaven Lab physicist Hucheng Chen holding a replica of one of the 50 cold electronics boards installed in MicroBooNE. He is standing next to a mock-up of one of MicroBooNE’s 11 signal feedthroughs—the part of the detector where electronic signals from the cold electronics of the time projection chamber are carried to the warm electronics outside the cryostat. To try to minimize noise, MicroBooNE researchers worked with the engineers and scientists at Fermilab and in Brookhaven Lab’s Instrumentation Division who had pioneered the development of “cold electronics” for the experiment. Placing the electronics inside the detector tank reduces noise by shortening the path each signal has to travel before getting amplified. But because the tank is filled with liquid argon, these electronics had to be designed to thrive at temperatures hundreds of degrees below zero, long past the range where conventional electronics, like those in your smartphone, can function. After a year of collecting data, the researchers had enough information to pinpoint three sources of excess noise. “The noise was nearly all from the conventional electronics outside the argon tank,” said Mike Mooney, a Brookhaven Lab post-doctoral fellow and a key contributor in the effort to identify sources of noise. Most of the noise came from the external power supply for the electronics inside the bath, and from small fluctuations in the high voltage that creates the tank’s electric field. The third and least significant source of noise was an unusual burst that appeared only at a certain frequency, but the team has yet to determine where this final source comes from. The collaboration initially reduced the excess noise by developing a software program to sift out the desired electron signals. This initial solution allowed them to collect higher-quality data while addressing the actual sources of noise. “We demonstrated that software could remove certain types of noise from the data without losing the very small signals we want to see” said Brian Kirby, the BNL post-doc leading the evaluation of the software fix. A comparison of particle interaction signals before and after MicroBooNE researchers removed the excess noise. With the software in place, the researchers could make the necessary changes to the detector’s hardware. They tackled the power supply noise by replacing the part that, just like your laptop charger, converts a higher voltage to a stable lower voltage that the cold electronics require. To combat the noise associated with generating the tank’s electric field, the researchers added a filter that would stabilize the high voltage. They eliminated more than eighty percent of the original noise with these hardware changes alone, and reduced it even further by then reapplying the software filters. The reconstructed neutrino paths are now sharply clear, like the burst of a small firework that was previously obscured by fog. These clean tracks are absolutely vital as the MicroBooNE team is implementing pattern recognition software to “train” a computer to pick out different types of neutrino collisions. 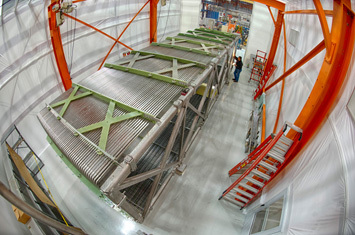 The MicroBooNE collaboration will continue doing just that, trying and improving, as it lays the groundwork for DUNE, the biggest neutrino experiment ever attempted. Brookhaven’s work on MicroBooNE was funded by the DOE Office of Science (HEP) and the National Science Foundation. What do shrimp, tennis balls and pulsars all have in common? They are all made from matter. Admittedly, that answer is a cop-out, but it highlights a big, persistent quandary for scientists: Why is everything made from matter when there is a perfectly good substitute—antimatter? The European laboratory CERN hosts several experiments to ascertain the properties of antimatter particles, which almost never survive in our matter-dominated world. 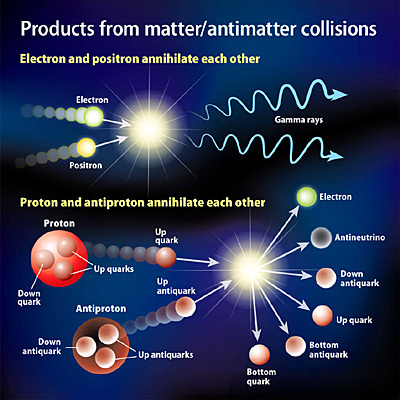 Particles (such as the proton and electron) have oppositely charged antimatter doppelgangers (such as the antiproton and antielectron). Because they are opposite but equal, a matter particle and its antimatter partner annihilate when they meet. Antimatter wasn’t always rare. Theoretical and experimental research suggests that there was an equal amount of matter and antimatter right after the birth of our universe. But 13.8 billion years later, only matter-made structures remain in the visible universe. Scientists have found small differences between the behavior of matter and antimatter particles, but not enough to explain the imbalance that led antimatter to disappear while matter perseveres. Experiments at CERN are working to solve that riddle using three different strategies. It’s well known that CERN is home to Large Hadron Collider, the world’s highest-energy particle accelerator. Less known is that CERN also hosts the world’s most powerful particle decelerator—a machine that slows down antiparticles to a near standstill. The antiproton decelerator is fed by CERN’s accelerator complex. A beam of energetic protons is diverted from CERN’s Proton Synchrotron and into a metal wall, spawning a multitude of new particles, including some antiprotons. The antiprotons are focused into a particle beam and slowed by electric fields inside the antiproton decelerator. From here they are fed into various antimatter experiments, which trap the antiprotons inside powerful magnetic fields. By cooling and trapping antimatter, scientists can intimately examine its properties without worrying that their particles will spontaneously encounter a matter companion and disappear. Some of the traps can preserve antiprotons for more than a year. Scientists can also combine antiprotons with positrons (antielectrons) to make antihydrogen. Scientists in CERN’s antimatter factory have measured the mass, charge, light spectrum, and magnetic properties of antiprotons and antihydrogen to high precision. They also look at how antihydrogen atoms are affected by gravity; that is, do the anti-atoms fall up or down? One experiment is even trying to make an assortment of matter-antimatter hybrids, such as a helium atom in which one of the electrons is replaced with an orbiting antiproton. So far, all their measurements of trapped antimatter match the theory: Except for the opposite charge and spin, antimatter appears completely identical to matter. But these affirmative results don’t deter Bertsche from looking for antimatter surprises. There must be unpredicted disparities between these particle twins that can explain why matter won its battle with antimatter in the early universe. The LHCb experiment wants to answer this same question, but they are looking at antimatter particles that are not trapped. Instead, LHCb scientists study how free-range antimatter particles behave as they travel and transform inside the detector. The particles-in-motion experiments have already observed some small differences between matter and antimatter particles. In 1964 scientists at Brookhaven National Laboratory noticed that neutral kaons (a particle containing a strange and down quark) decay into matter and antimatter particles at slightly different rates, an observation that won them the Nobel Prize in 1980. The LHCb experiment continues this legacy, looking for even more discrepancies between the metamorphoses of matter and antimatter particles. 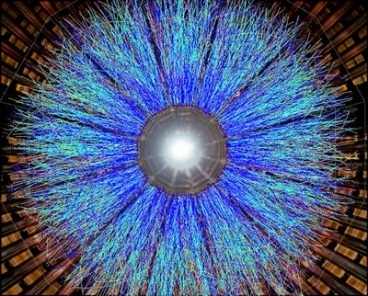 They recently observed that the daughter particles of certain antimatter baryons (particles containing three quarks) have a slightly different spatial orientation than their matter contemporaries. But even with the success of uncovering these discrepancies, scientists are still very far from understanding why antimatter all but disappeared. Most antimatter experiments based at CERN produce antiparticles by accelerating and colliding protons. But one experiment is looking for feral antimatter freely roaming through outer space. The Alpha Magnetic Spectrometer is an international experiment supported by the US Department of Energy and NASA. This particle detector was assembled at CERN and is now installed on the International Space Station, where it orbits Earth 400 kilometers above the surface. It records the momentum and trajectory of roughly a billion vagabond particles every month, including a million antimatter particles. Nomadic antimatter nuclei could be lonely relics from the Big Bang or the rambling residue of nuclear fusion in antimatter stars. But AMS searches for phenomena not explained by our current models of the cosmos. One of its missions is to look for antimatter that is so complex and robust, there is no way it could have been produced through normal particle collisions in space. If an antimatter kingdom exists, astronomers expect that they would observe mass particle-annihilation fizzing and shimmering at its boundary with our matter-dominated space—which they don’t. Not yet, at least. Because our universe is so immense (and still expanding), researchers on AMS hypothesize that maybe these intersections are too dim or distant for our telescopes. AMS has been collecting data for six years. From about 100 billion cosmic rays, they’ve identified a few strange events with characteristics of antihelium. Because the sample is so tiny, it’s impossible to say whether these anomalous events are the first messengers from an antimatter galaxy or simply part of the chaotic background.